We've talked about this, right? 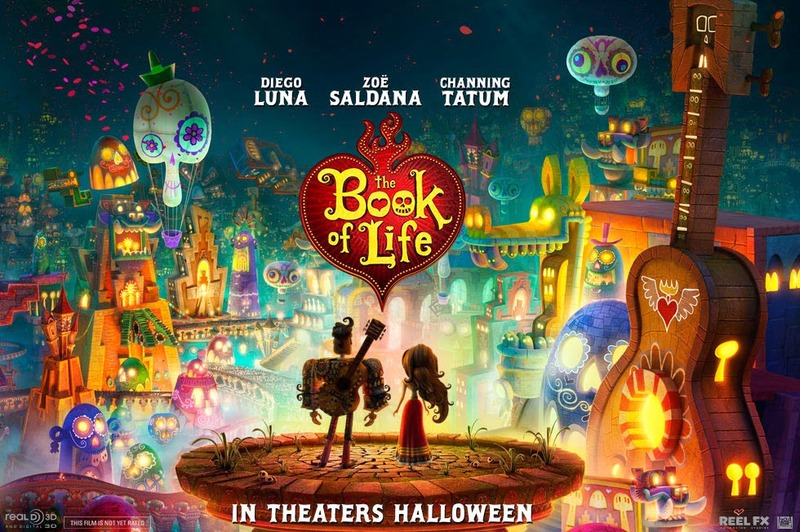 How much I want to see The Book of Life? Not only do I love the look of the film, I have always been fascinated by Dia de los Muertos, the holiday on which the movie is based. From October 31 to November 2, friends and family gather to celebrate and remember loved ones who have passed on and calaveras (the decorated skulls often made out of sugar), marigolds, and feasts play a big role in the festivities. So you can well imagine my response when I found out Torrid, the plus size sister store of Hot Topic, has an adorable new line of clothing inspired by the movie and incorporating themes from the holiday. I'm not ashamed to say I bought one of the pieces as fast as my internet connection would allow. My preccccciousssssss! Sugar skulls? Marigolds? Vibrant colors? 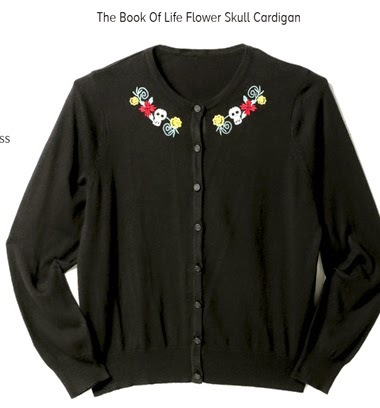 This cardigan has it all. No wonder I ordered it. 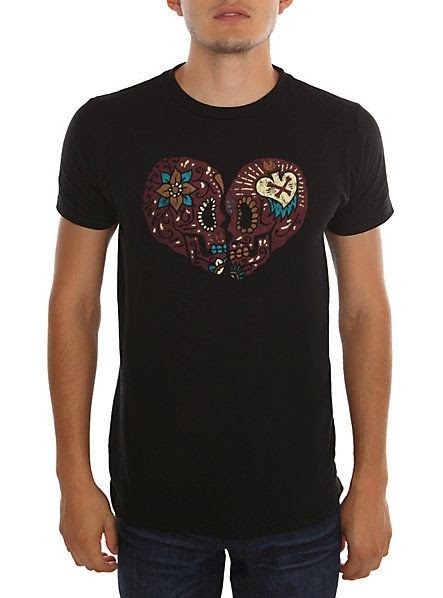 And, for those of you on the slimmer side, you can get one from Hot Topic. 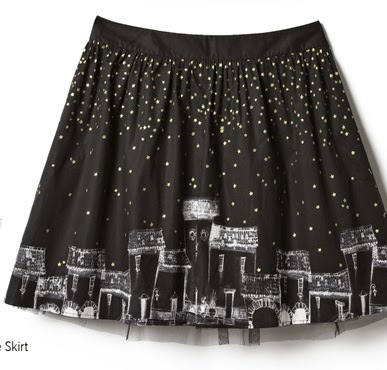 This skirt almost makes me wish I actually wore them. The gold and silver stars in the sky are a nice, subtle touch. Hot Topic also has a version. 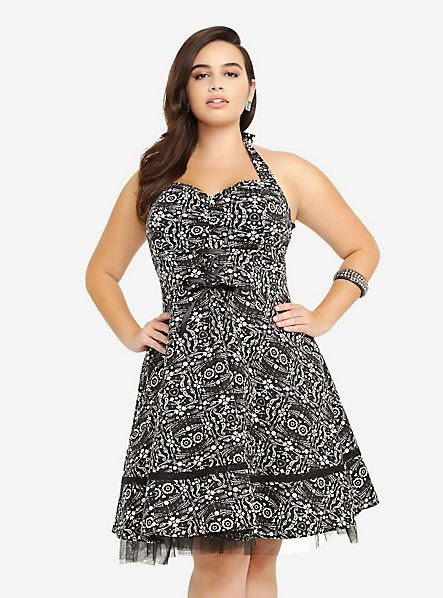 I also love the sugar skull print on this halter swing dress. It's smaller sized twin can be found here. Hot Topic also has a great unisex t-shirt inspired by the film. So, how about you? Are you planning on picking up one of the pieces?